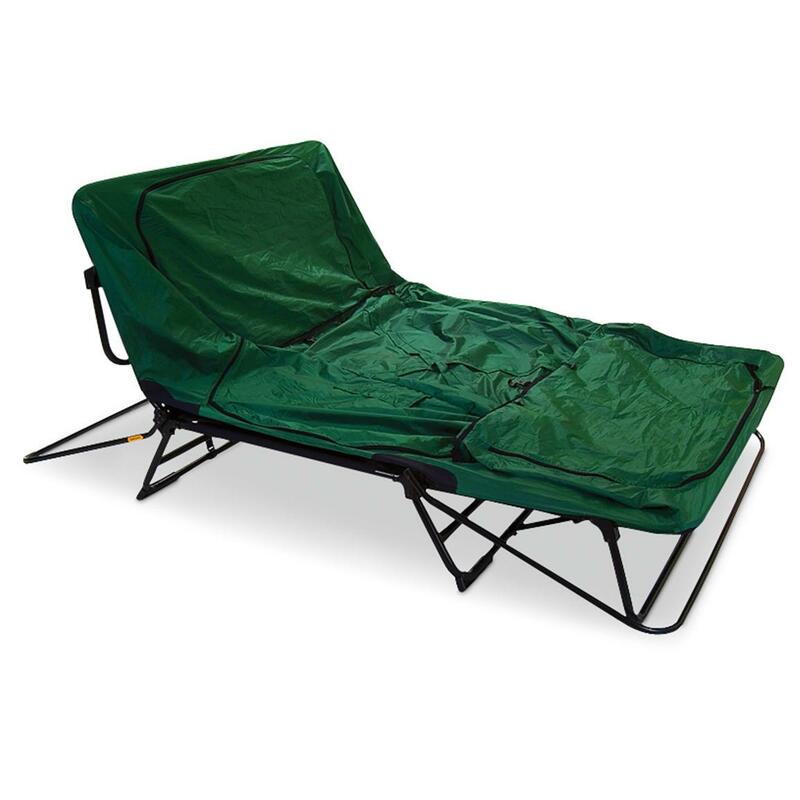 Sack out atop the Kamp-Rite® Oversized Tent Cot for camping comfort off of the ground. This luxury sleep shelter stands 11" high... above ants, critters and moisture. Plus, it features a wider, longer sleeping area for added comfort, so you can stretch out even more! And when daytime hits, use its unique hinge design to covert it into a sun-soaking lounge chair. Comes complete with waterproof Kamp-Rite® Rainfly and convenient Carry Bag. Rest your bones! Order today! Setup Dimensions: 90"l. x 32"w. x 47"h.
Folded Dimensions: 36"l. x 34"w. x 7"h.
Bed Dimensions: 90"l. x 32"w.
Tent Dimensions: 90"l. x 32"w. x 36"h.
Kamp-Rite Oversized Tent Cot is rated 4.6 out of 5 by 10. Rated 5 out of 5 by David from LOOKS GREAT,price is rite Got one of these tent cots a few years ago, was very pleased with it. Made the mistake of leaving it all zipped up during a rain storm, and it got pretty banged up, so I will be needing to replace it. Rated 5 out of 5 by Jlonghi from Missing Rainfly Basically mine came without the rain fly but they corrected their mistake and sent a whole new one and a shipping label to make it easier and free for the mistake to be corrected! I also believe it was more of a Kamp-Rite error and now sportsman guide on the missing rain fly! Rated 5 out of 5 by scout master 68 from first time great my first time using it was camping in a rain storm setting up after dark. set up the tent never looking at directions in the dark and rain it was easy,and fast. i am 6ft tall 250 lbs i was dry all night had more room then i thought i would and stayed very warm. love it so far. Rated 4 out of 5 by Ned1 from Good Concept I like the tent cot concept and they are comfortable enough. They appear to be built just well enough. I bought two of them and I am satisfied with them. The only draw back is that they weigh 38LBS. 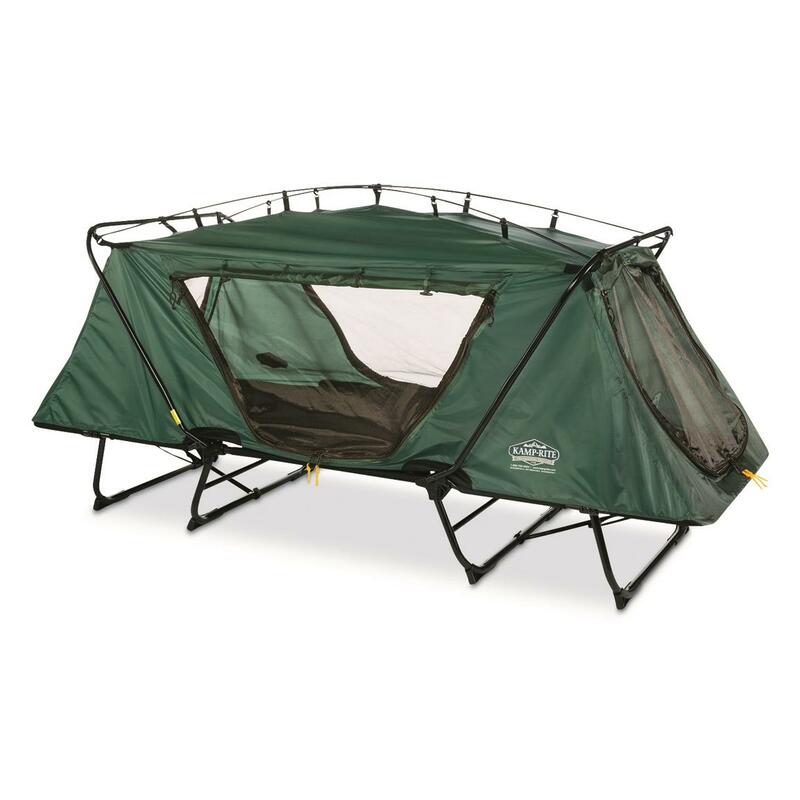 Rated 5 out of 5 by wolfpack44 from Functional The tent cot is perfect for a camper or hunter whom does not want to waste time and energy of putting a large tent. It is easy to transport and the set-up is easy.The cot is comfortable and roomy. It is weather tight. I highly recommend it for limited purpose camping. Rated 5 out of 5 by SAMSANAM from Great product. Will buy a second one for my brother. 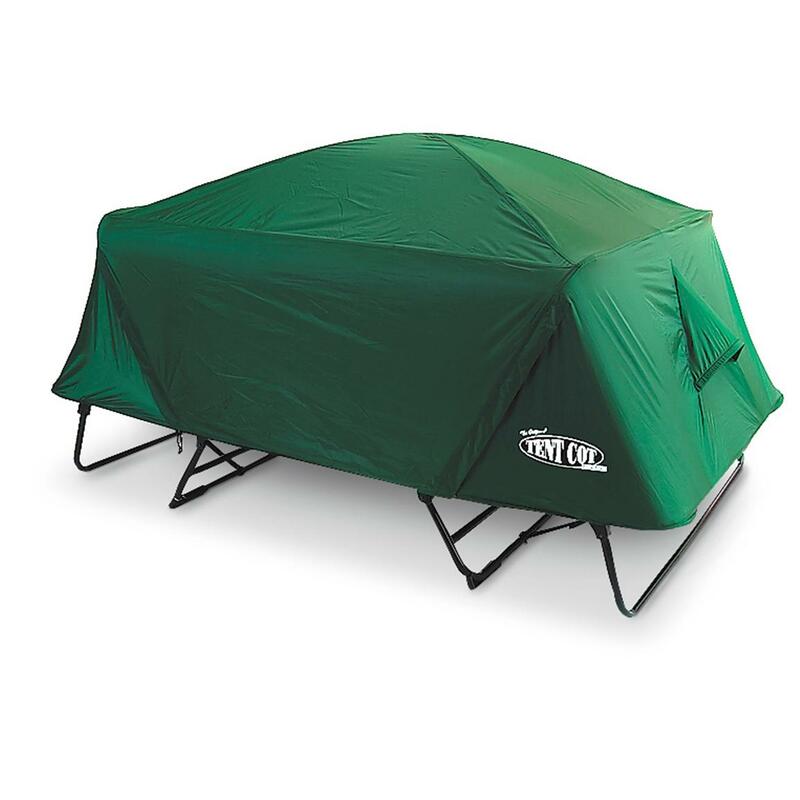 Rated 5 out of 5 by MARK from I just used the tent/cot camping recently and it was comfortable and easy to set up. Don't buy this if you are claustrophobic but you will be happy with the simplicity of use. it fits in my motorcycle trailer as well as my blazer. The rainfly works nice but the vents need to be reinforced to stay open to reduce condensation.